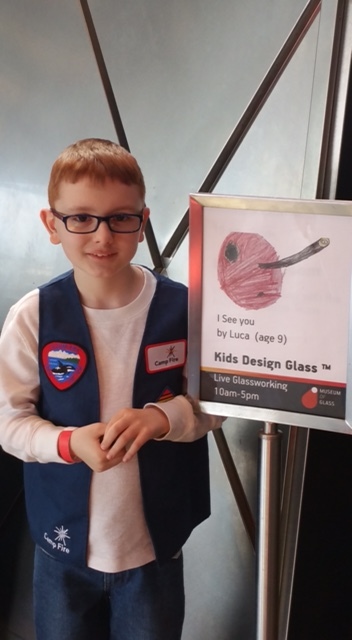 Kids Design Glass™ (KDG) has been a core educational program at Museum of Glass MOG) since its inception in 2004, inviting children both within and without the Museum to submit their designs. Although the process of selecting and transforming drawings into glass sculptures happens inside the Museum’s Hot Shop, MOG has partnered with outside organizations to bring Kids Design Glass to new audiences. 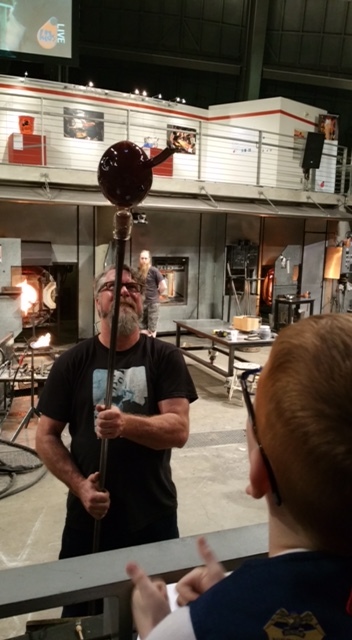 In March, Museum of Glass worked with Camp Fire, a national youth development organization, to incorporate glass art education into the program’s educational curriculum, as well as extend a Kids Design Glass opportunity to Camp Fire’s young participants. As part of a yearlong partnership between the two organizations, Camp Fire youth 12 and under from across the nation were invited to submit their drawings to Museum of Glass, encouraging kids and families to explore the medium of glass and their own personal creativity. With the incredible amount of creative designs submitted, choosing just one drawing is always a difficult task for the Museum’s Hot Shop Team. After reviewing all submissions, Camp Fire’s nine-year-old Luca Thede’s design, I See You, was selected. Luca ready to see the Museum’s Hot Shop Team transform his design into glass. Luca reviews the work in progress as artist John Miller shows him his sculpture. 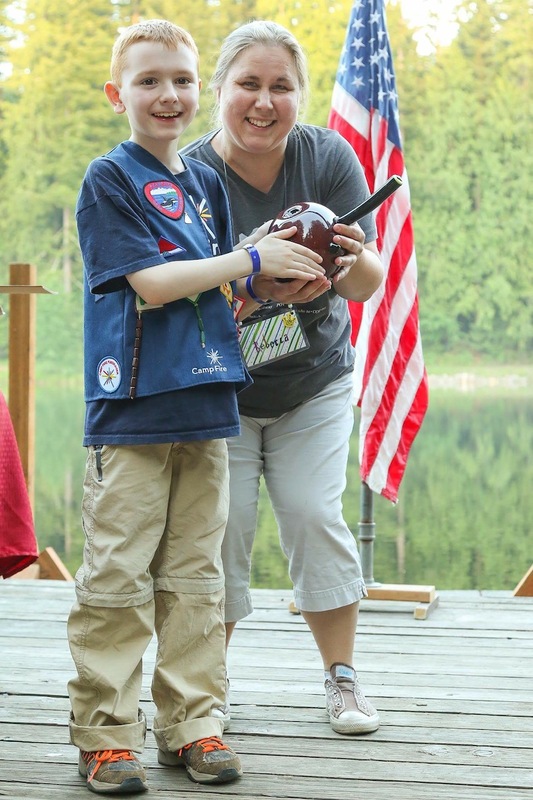 Described as a boy of little words, Luca’s mother revealed how Camp Fire has encouraged her son to meet new friends. Similarly, being the selected Kids Design Glass artist challenged Luca to take center stage, nurturing his self-confidence, and talk to the Hot Shop’s artists about his vision for the sculpture. Luca receiving his glass sculpture from Museum of Glass Registrar, Rebecca Engelhardt; Photo by Bob Noble. Museum of Glass will continue to partner with other organizations, including Point Defiance Zoo & Aquarium, in conjunction with the Museum’s upcoming exhibition, Into The Deep. Opening September 24, 2016, the new exhibition celebrates glass artists who are inspired by the ocean. It explores the way artists use glass to capture the motion and light of being underwater, as well as the colors and textures of marine life. In an effort to connect the Museum to its local marine organizations, exhibition curator Katie Buckingham believed Point Defiance Zoo & Aquarium would be the perfect place to collect drawings for an Into The Deep– themed Kids Design Glass sculpture. Museum of Glass and Point Defiance Zoo & Aquarium will collaborate on Kids Design Glass in spring 2017. The selected marine-inspired drawing will be transformed into glass on Sunday, April 30, 2017. For all Kids Design Glass dates, visit the Museum’s calendar. This entry was posted in Art, Glass, Museums and tagged art, Camp Fire, Cathy Tisdale, glass, Hot Shop Team, Kids Design Glass, Luca Thede, Museum of Glass, Thrive(ology) on June 8, 2016 by Museum of Glass. We just came across this posting and we think that it is great! These are the types of things that we would like information on as far as helping sponsor. Glass is such an interesting medium, getting kids involved is great!